Sri Lanka's capital Colombo has been hit by at least two new blasts, hours after the country was struck by a series of six bombings on churches and hotels that killed at least 156 people and wounded about 400, Al Jazeera reports. The seventh explosions occurred at a hotel near the national zoo in the capital, killing at least two more people, police said, while an eighth blast hit the suburb of Orugodawatta in the north of Colombo. There were no further details on what was targeted, police said. Most of the victims were killed in three churches where worshippers were attending Easter Sunday services. Three other bombings struck luxury hotels - the Cinnamon Grand, Kingsbury and Shangri-La - located in the heart of Colombo, killing at least 35 foreigners. The first explosion was reported in a church located in the capital. The other blasts followed within half an hour. 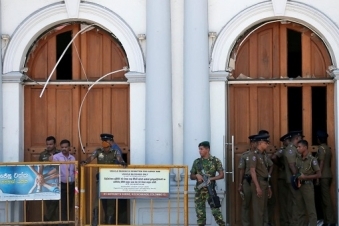 One of the churches targeted was St Anthony's Shrine in Colombo. The other two were St Sebastian's in Negombo, about 30km from the capital and another in Batticaloa, 250km east of the capital. Prime Minister Ranil Wickremesinghe convenened Sri Lanka's top military officials at an emergency meeting of the National Security Council following the blasts. He has also called for an emergency convening of the nation's parliament on Monday.